As Vikram carried Betal, he narrated another story. One day, a king went hunting in the forest and lost his way. A man named Rajdeep helped. The king made him his guard. One day, Rajdeep met a beautiful girl Deepti and asked her to marry him. Deepti agreed and Rajdeep took her to the king. 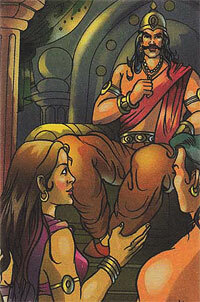 On meeting the king, Deepti asked him to marry her. On hearing this, Rajdeep was hurt, but he agreed. The king asked her, "Why do you want to marry me instead of Rajdeep?" Deepti replied , "Because I want to live in a palace." The king gave Rajdeep a palace and asked Deepti to marry him. Betal asked Vikram , "Whose sacrifice was greater , the king's or Rajdeep's?" Vikram replied, "The king's because Rajdep was only being loyal to his master and even if he wanted he couldn't stop Deepti from marrying the king." Betal heard this and flew away.